Public sector labor union Verdi continued its program of strikes against airports in Europe, stemming from disagreements concerning wages, staffing, retirement arrangements and possible job losses. The action will affect ground handling, check-in, security and fire cover at selected airports through 5:00am on Friday. 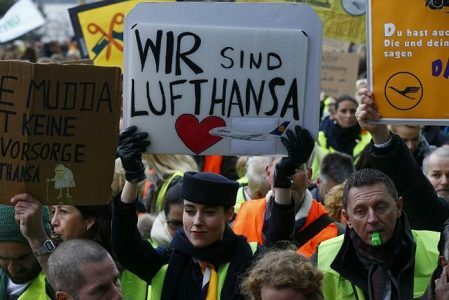 Yesterday 350 flights were cancelled by Lufthansa alone in work stoppages at a host of German cities including Munich, Frankfurt and Hanover. In France, air traffic controllers commenced industrial action last night, for the third time in a month. European airlines claimed more than 3,000 flights have been canceled through June of this year due to nine separate labor actions, and the CEOs of Europe’s five largest carriers asked the European Commission (EC) to legislate a reduction in such strikes last month. The pattern of strikes — and threatened strikes — has played out for decades now in European aviation, and is familiar to frequent fliers on trans-Atlantic routes. And as noted above, labor actions can arise not only from airline employees but also from air traffic controllers at a patchwork of national networks throughout the continent. Luckily for travelers, the EC has an Air Passenger Rights directive which clearly states what compensation is due travelers when their flight is cancelled. USA Today has put together a guide to your options when your European flight is cancelled, which you can read by clicking here.